"When we found out that we were being relocated to the Dallas area, I was less than thrilled to leave an area that I loved and had lived in for over thirteen years. Donna sent us a very informative packet regarding the Dallas area. By the time Donna finished showing us homes, we felt very relaxed and knew our transaction was in very capable hands. We were still living 1,300 miles away, but Donna made it seem as simple as being three miles away. Our purchase went through without a hitch." She Is The Only Agent I Will Ever Use! 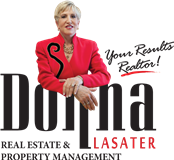 "I have used Donna in buying and selling every home I have ever purchased and sold. So has my twin brother, Mike, and his wife, Betty. We trust her and she has always done a great job for us. She is the only agent I will ever use!!!" "We appreciated all her hard work. We had listed our home with another agent who is a top competitor of hers. But our home didn't sell. We were overjoyed with the personal attention we received from Donna. Our home sold quickly and we were constantly informed about what was happening." Wow, We Couldn't Have Done It Without Her! "Donna introduced us to the area with a complete tour and assisted in all phases of our relocation process. We kept in close contact before we moved. It was reassuring to know there was someone on the other end looking out for our interests. When we got to Texas, Donna helped us with the closing process and even helped find a reasonable homeowner's insurance rate. She has been a great source of information about our new hometown including a dentist, a vet and even a hairdresser. Wow, we couldn't have done it without her!"